Kate Kane's life has always been one of intrigue and adventure, but since she took on the mantle of Batwoman, things have been in overdrive with no sign of slowing down! 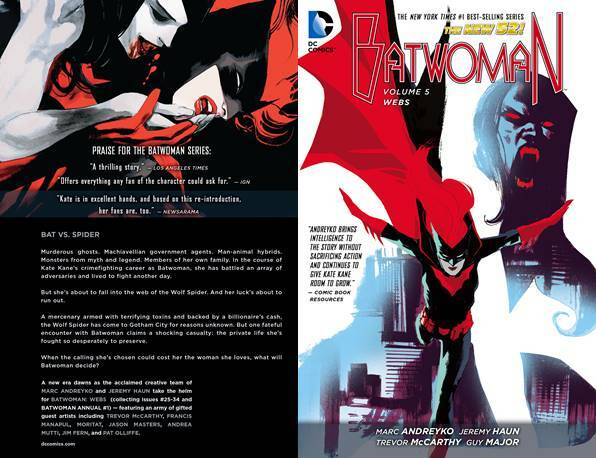 Join us as Batwoman starts her next chapter and faces a threat that might just have her rethinking her career as a hero! But her life as a hero isn't Kate's only concern, as Maggie has a surprising revelation and her very angry ex-husband shows up! Can Kate and Maggie work together to discover the secret of the Wolf Spider? Collects BATWOMAN ANNUAL #1 and BATWOMAN #25-34.